Are you looking for a way to make your TPT store exciting and fun? 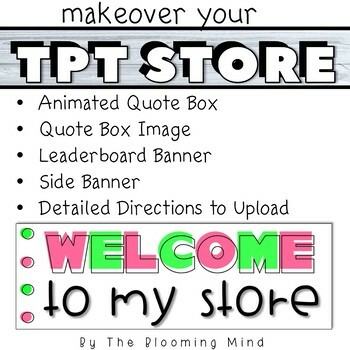 Makeover your TPT store with this TPT Store Design Kit! Save yourself time by uploading this PINK AND GREEN animated quotebox, leaderboard banner, and side column banner. Don't feel like wasting time thinking of the perfect quote and researching how to create your TPT store banners? I've done all the hard work for you! Each element in this design kit has been designed for you to easily make your TPT store look polished and professional! "Follow me by clicking the green star"
"Check out my featured free item"
These banners are similar to the ones in my store. Click here to check them out in action! You can also check out the preview to see what's included in this set. 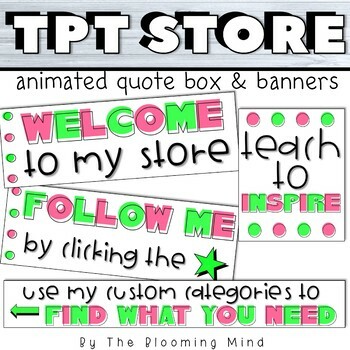 If you're looking for other TPT store graphics, check out my resources for TPT sellers. Looking for a different style animated quote box & banners for your store?